The Mac Photos app works well for most users, but occasionally a variety of hiccups can be encountered when interacting with photo libraries, ranging from crashes, to hanging on Photos app launch, a failed import, thumbnails missing from an image library, pictures missing from a library that was imported, or even a completely empty Photos app on launch despite having the proper photo library selected in the Photos app. If you encounter any of these library management and photo library viewing issues, you can manually trigger a repair of any photo library, which will often resolve the problem being experienced. 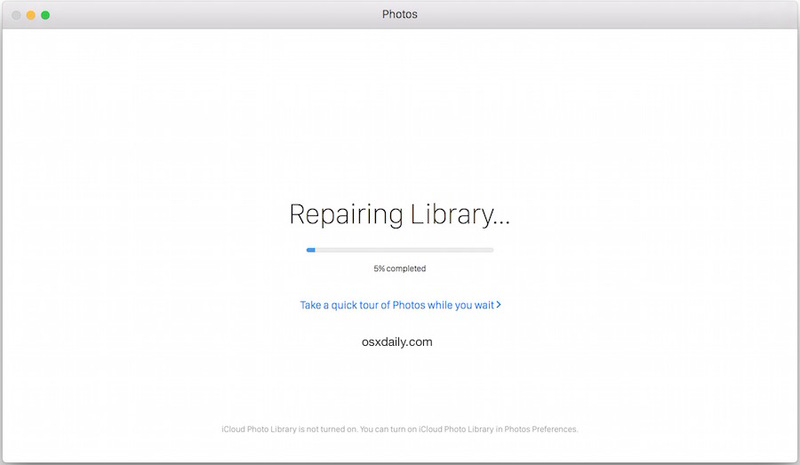 Though repairing the library is supposed to fix problems, it’s a good idea to backup the Mac and your photos library into Time Machine, or your backup method of choice, before attempting to repair it. This is a precautionary measure just in case something happens to go wrong in the repair process. Pictures and image files are often some of the most important data that users maintain, thus it’s good practice to take extra care and back up of these critical files. You can keep track of progress by watching the “Repairing Library” status bar, the process of repairing a library can be fast or very slow, depending on the speed of the Mac, the size of the photo library, and numerous other factors. If you have a large library, be prepared to wait a while. Do note this will offer the library repair procedure on the currently active and selected photo library, so if you’re juggling multiple libraries be sure you switch to the one you wish to repair. If repairing the library doesn’t fix your issue, you could always try to use iPhoto instead of Photos app in OS X either as a temporary measure, or perform the same repair procedure in iPhoto before attempting again to migrate the iPhoto library into Photos app again. As always, back up your data before doing so. Did repairing the Photos Library resolve the issue you were experiencing with Photos app? Leave us a comment and let us know what the problem was, and if it worked to fix it, or if you happened to find another solution. it is possible to organize photos by exif timestamp (instead of filesystem timestamp)? Photos app is pretty limited at the moment and the sorting options are what you can see. You can edit the timestamp of files if you want, but there are not many options to change sorting in the current version. Expect this to change in the next releases as the app gains more features. Are these letters and numbers supposed to mean something???! My biggest disappointment with photos is the inability to manually input location information p. You could do it in iPhoto, but Apple took awy that ability in Photos. I’m hoping the next update fixes that. Apple is good at taking useful features away from its products I think they just like to piss their customers off! They really have gone down in my estimations. Nope, this did not work for me. I tried it multiple times and the command option hold did not produce a sign to repair. I cannot enlarge my photos to view them and I also cannot play any of my videos when I click on them. I’ve tried both apps and neither are working right. Holding Command+Option when launching Photos app absolutely does produce the Repair Library option, you are doing it wrong. Hold the Command+Option keys on your keyboard. Actually, no it doesn’t work. Cindy probably knows how to hold down these two buttons just as well as I do. I am not getting the repair window to come up. I have been using a Mac since (probably) before you were born (1984). It HAS worked for me before, but is not working now. I DEFINITELY know how to press two keys and launch an app – as does (probably) Cindy. Just because something works once, does not mean it will work as it’s supposed to at a later time. Don’t be a meanie! Wont work for me either. I have never liked Photos and mighty pissed off when Apple stopped supporting Aperture. I’m sure it just is hard when someone of her stature has to deal with mere mortal who cannot possess her mind reading capabilities or basic keyboard usage knowledge. Works fine in Photos for OS X El Cap all versions, make sure you follow the directions. I know how to hold down two keys. Without them it says “unexpected error preparing your library” then offers me the Quit option and something in the middle twiddling around. With the keys, Photos offered me the option of creating a new library so I created a temp one. Now all it sees are the temp one (with 4 pix) and two way old iPhoto libraries whose last picture was in 2012. It in no way offered me a repair option, and indeed I can’t even FIND the old one that has or points to the pix from last week. I don’t remember what it’s name is but I’m running a diskwide scan for something called Photo Library. It was working fine before El Capitan. I have the same problem, several photos are missing with only low resolution thumbnails or no thumbnail at all and a white space. I am in great despair of losing those photos! Cindy, I was having the same problem but found that I was pressing Command + Option after clicking on photos rather than holding Command + Option down then clicking on the photos app. 1) I just copied the whole broken library file to an external drive. 2) After doing that, I deleted it in the original location (if you don’t want to just move it to the trash, use terminal to completely delete it). 3) I launched Photos holding down the Option key and created a new library and quit the Photos app after that. 4) Then I went to the folder in my external drive with the library backup, right clicked on the file and choose “Show Package Contents”. 5) Finally, all had to do was drag and drop the “Masters” folder into the Photos icon in the dock and it imported all the photos from my broken library to the new one. p.s. – That’s what worked for me, can’t assure this method will keep any customization such as tag faces and alikes. And the albums were arranged in the same order? A great workaround. Unfortunately, Photos will not export any photos and does not show them in pictures. When I try to export them, Photos says that the photographs do not exist. Yet, they show in Photos. The same seemed to happen for me, but I was opening and THEN hitting OPT+CMD while it was opening. I don’t think you were doing it, but the instructions said to do it that way. You have to hold OPT+CMD *before* Clicking to open. It got further, but just gave me the same message until I decided to go to the photos library in iCloud to see if I could fix it there. Indeed it was the source of corruption, I fixed it, and it worked fine after that. Btw, if my comment about “Cindy’s” rudeness gets posted, I meant to write “tb”. tb, you are a rare life form with interesting social skills. OS X 10.10.3 and the new Photos app is one of the worst roll-outs from Apple I’ve experienced. I’ve talked with more than 18 Apple support techs about problems and issues, and only two knew what they were talking about. The two who were able to help me acknowledged Apple is “dumbing down” all their apps to work on the lowest common denominator among the hand-helds. Say to goodbye to Apple quality in the Macs and MacBooks. Have you seen the new MacBook with only one port that also serves as the adapter port? This is the “new” Apple. I’m moving my pictures albums to Windows with Lightroom. I agree 100%. As an Apple user for well over 30 years I can say that 1) they got so much better over time, and 2) their quality standards have declined in the last 3-4 years. They are simply trying to do too many things and paying much more attention to design than to quality. Yes, love the design aspects, but quality has got to be there. Photos and iTunes are unmitigated disasters! Agreed David. They are next to useless and impossible to manipulate. When I first started Photos it brought over all of my photos from iPhoto (on a Retina MBP, 10.10.3), but on several albums got the dates wrong by many years. Unfortunately the suggestion here to rebuild the library holding down CMD+OPT keys did not solve the problem. I also experience the date issue. Have you found a solution? Yes, I have the same issue. Some of my photos are forward dated. Have you found any way of fixing this? I would not have quit iPhotos for Photos had I known more. I’ve got thousands of photos on the iPod, but they don’t display by name anymore. The old way of ordering them by name is gone. Organizing them by date is terrible for people who like to see their photos using A to Z. That date may be correct. Have you traveled through time recently? Fixed! A little more than half of my photos uploaded to iCloud, the rest wouldn’t upload no matter how many times I rebooted or restarted the app. Thank you! Photos couldn’t repair the library and therefore I had to use iPhoto to transfer all my images from my backup. Photo has attributed wrong locations to a big chunk of photos. Instead of Los Angeles they are now in Jiangsu, China. WTF. Congrats on visiting Jiangsu China with your iPhone! Put those into your Photos app now. Same thing is happening to me. First time using a Mac. Did you ever fix this? After the “update” to Photos, I can now no longer e-mail photos (unless I either paste them into Outlook or export them to the desktop or elsewhere first-and therefore they are the original size which is not ideal), nor do any photos show up in the media browser-so pretty much I can’t do anything with my photos other than upload them to Facebook. I’ve looked high and low for solutions and am beyond frustrated to say the least! Let’s open this with that Photos is one of the worst photo apps I have ever encountered and I thought iPhoto was awful. My wife put together some really spectacular slideshows of our many trips using iPhoto and but now with the migration to Photos, she is struggling trying to make them work. Music selections are gone, display patterns have changed and the choices of display playback are very limited. Is Apple ever planning to bring back or at least add in playback options/features that were in iPhoto? The Photos app does not exist in OS X 10.9.5, so do not worry about Photos app if you are using that, it is only available in modern versions of OS X. Otherwise, iPhoto is available for those users. I did this and it still has not corrected my thumbnails. Several of them are black, gray, or simply wrong. Any advice? My thumbnails appear okay, but the photo goes black when I try to edit, or contains large black areas. If I try to do anything with blackened photos, the entire app goes down. I’ve done the repair routine three times and still have this problem with several–always the same–photos in spite of being able to see the thumbnails. Give us back Aperture! My vacation photos that were imported from my GoPro Hero 4 Silver went missing from the Photos app 3 days after I imported them into the library. These photos and videos were very important to me and I have not been able to get them back, even after the repair. I swear I shut the computer off one day and the next time I turned the mbp (v 10.10.4) back on the recent photos and videos (about 2000 files) were gone and my “most recent import” showed an album that I imported a few months earlier. Try checking earlier dates. My GoPro had the wrong date set and they disappeared on me too. Found out they were in an album from a previous year. Try going to albums > videos to see all your videos. If you find them and the date is wrong you can change it in the main menu under image > adjust date & time. Photos completely lost all the albums that imported in from iPhoto. I have restored from backup twice, the albums are there and then vanish. The library rebuild did not help. Hi, Eric, the same happened to my albums! Did you find a way to rebuild it? Thanks. I just did the rebuild of the Library and now over 2/3 of the albums I had my photos organized into are gone. The photos are still there, but not the albums. Any thoughts on how to get them back? Hi, Martin, the same happened to my albums! Did you find a way to rebuild it? Thanks. Same thing happened to me within the last couple weeks. I made a genius bar appointment and spent 2 hours at the store with no resolution. If you guys figure it out I’d love to know. I tried repair, but no help. My photo app will not open. It actually opens for a second or two and then automatically closes. I’m at a loss. Can anyone help me. I have 30,000 photos buried in this thing! I have never been able to keep the library synced between devices. I started with a relatively small (1,500 photo) library to be synced between a Mac air laptop, iPad, and iPhone. After giving the final approx 50 items more than two days to sync, I finally just deleted them (my master copyis on a Mac mini) and got everything synced. It stayed that way until I deleted a shared folder which never disappeRed on one device. I later deleted all the pics out of one folder and the folder would not disappear on The web iCloud. I imported some pics and one pic would never sync. (It was a jpg of less than 3 mb). I turned off cloud sharing on the device with the pic and left off for a couple of days. After turning it back on, after more than 8 hours of uptime, only 2 pics had synced. The amount of time I stakes to sync has always been terrible. I use Dropbox to sync to to get the pics to my main library on the Mac mini and it always has been able to keep in sync within minutes correctly. I am so tired of fighting to keep the Photo app pics in sync. This is supposed to “just work”. OS X is T H E D U M B E S T OS of all times. Apple is the dumbest company of all times. Going back to Windows 10 and never look back ever. I find that Photos on my Mac is unstable, especially working with projects. It will freeze, and oftentimes crashes the entire system so that I need to do a hard reboot. I couldn’t order a book I made with iPhoto, so I had to resort to upgrading to Yosemite. I regret that move. The editing toolbar in Photos has disappeared from where it used to be (in the bottom right side of of the album screen). This is the toolbar that lets me fix redeye, adjust colors, etc., and share my photos. How can I get it back? Open a picture, then tap on the “Edit” button in the upper right corner, that should bring up the color tools and adjustment features. After migrating from iphoto to photos, the number of photos in the libraries do not match. My iphoto library had 30,900 photos, and the new photos library has 29,500. It’s near impossible for me to visually check which photos, if any, are missing. Could the discrepancy be due to duplicates that were not imported? Ever since I’ve updated to Capitan, my Photos library’s been updating and been stuck at 85% for the longest time.. I’ve tried everything you can imagine to fix it. Please help! Restored “Photos Library” from time capsule. Now I get error message that it “could not load image” when I try to export the restored images. I also get an error message when I try to edit. I ran repair successfully, but it made no difference. what’s with all these Hillary Clinton ads? This helped me. Recently imported pictures were not showing up in “moments” or “collections” views. But the rebuild put them in their correct places. Thanks for this. I launch Photos. It want stay on screen. Goes away quickly and I get a triangle error with nothing but coding. I have thousands of scanned photos taken before digital cameras were invented. They have a date stamp showing the date I scanned the photo (either from a print or a transparency). Obviously this is not the date I want, so I need to change this date to the date the photo was taken. Easily done in good old iPhoto. Go up to the menu bar and select Adjust Date and Time, and select the correct date. The photo now gets positioned correctly relative to all the other photos. Job done eh? Not when you sync your photos using iTunes and look at the photos on your iPad in the ‘wonderful’ new Photos app! The Photos app always refers to the Date File Created (don’t confuse this with the Date Created, which isn’t the same) so it places it at the date/time you scanned the photo. I have tried correcting the EXIF data, but Photos ignores it. Apple have tried to make everything simple and idiot-proof, so the Photos app has hardly any controls or user preferences which would allow you to correct or adjust the way Photos displays images. This is a stupid and ridiculous idea on the part of Apple. If they don’t wake up and see the damage they are doing to their reputation by over-simplifying their applications they will lose me, a loyal Apple user since 1991, and many others too. I couldn’t agree more. I’m also a loyal Mac user and just purchased a new MacBook Pro over the holidays. I’ve been struggling to get Photos to share a local photo library between myself and my wife, something I was able to do seamlessly on my old Mountain Lion/iPhoto combo. Every time I try to do something outside the tightly curated world Apple has in mind for me, I run into endless issues. Increasingly, it looks like Apple is trying to turn our Macs into iOS devices. If that’s what I wanted, I wouldn’t buy a $2k+ laptop! Wise up Apple! You are starting to p$ss off your loyal customers. I have been trying to free up room on my iMac by exporting my photos to an external drive. 10K plus always getting stuck a bit over 8K. Is there a way to mass transfer photos easier than export? I tried uploading them to iCloud, Amazon Photo and the process is well FOREVER. Any help would be gratefully accepted. disabled prefrences> photos > My Photo Stream + iCloud Photo Sharing since an external than Apple computer adviser pointed me that ‘cloudphotosd’ was crashing every minute. I am also running into an issue trying to repair a Photos library I had moved to an external WD MyCloud drive. The Repair function says it is 99% complete and just sits there for days. Any clues on what to do? This is a fairly large library (around 300GB). How long should I expect to wait before the 1% remaining of the library repair function completes? Opened iPhoto library with Photos and it migrated the pics to Photos library, used it for a week, then opened a different library on an external drive which Photos migrated. Now when I try to switch to the original library, Photos will not recognize the library even though Finder shows it as migrated. Help! When I upgraded to Yosemite I did not realize that it would also install Photo and move all my photos to it. When Photo came up, most of the the thumbnails were missing. Where thumbnails should be, there was only a blank-white square, or a solid black one. If I click on the blank or black space, the color image will show up full-page. At first iPhoto was totally missing. It finally showed back up after several days. I now have three libraries, one for Photo, and two for iPhoto. The Photo and one iPhoto show my albums. The other iPhoto one shows no albums and there are 3 copies of most pictures. I lost all mine and rang Apple support and they talked me through getting the original iPhoto library file from within an old iPhoto library location in TimeMachine and I had to accept then having Photos (which I dislike compared to iPhoto) but I got my whole picture library back intact. Could you comment on the opposite effect I have which is that ‘repair’ happens every time I open photos 1.3. Where could things broken that this occurs all the time? I am also prompted to repair the system library (shared) every time I open photos on any user profile. Suggestions? I pressed command and option and launched repair and it says repair cannot be completed. This is the first migration of photos from time machine to a new macbook pro. Add on to question above: Should I try connecting old macbook air to new macbook pro to migrate the photos versus time machine . . . ? Stupidly I upgraded to new version of OS X and didn’t realize that Photos was replacing iPhoto. Anyway, all my pictures loaded into Photos and was working fine(although I really dislike the program) until recently backed up my iPhone 5 onto computer before I upgraded to 6. Here’s the kicker, Photos launched but as if it was all new again and is stuck (for DAYS) “building library”. If I try to quit the app, message says can’t quit until finished building library. What do I do??? Are my photos there somewhere?? I can’t go back to iPhoto b/c I message that I need to update to newer version but said version isn’t available anymore!!! HELP! The advice on top of page does not stop import of jpg going into Albums instead of Photos in the Photos App. The whole thing about Photos is that it is a daft name. iPhoto was a known brand and you knew what you were dealing with. Photos is the same name that everyone uses for their photos so it’s confusing and a stupid name for the App and a pointless change. iPhotos was a good App. My MacBook is now a little over a month old. I have a Pro 13 inch directly from the Apple store. I uploaded pictures from my camera to my MacBook, and hit “Close Library”, as my computer is shared and other people need to get into other accounts on the Mac. The library will not close. It has been saying “Closing Library” for 4 days now; nothing is working to fix this. Help! My sister has a science project that she needs the laptop for and it’s stuck on MY account. She can’t fail the assignment because of Apple, it’s just not fair. Just reboot the Mac if you can’t do anything else. I did the repair then tried to arrange an album and it’s now frozen with the wheel of death for 20 mins. Repair did nothing. Worked for me! Photos was suddenly launching ‘as new’ with no visible photos – though oddly my albums & slideshows were still accessible in the sidebar. Option-click on launch to select the library didn’t change anything, but the command-option-click rebuild option worked, and surprisingly quickly through 17000+ photos. Wasn’t previously aware of this rebuild tip – so many thanks! Worked for me! My photo library wouldn’t back up to my external hard drive. I rebuilt Photos and it backed up fine. A 93 GB library. Thanks! I wish to weigh in with what worked for me. My Photos live on an external drive, dedicated to photos. There is one folder there called Photos, on Yosemite it always just looked like a regular folder and I could double click into it and see the base data with actual photos sorted in folders by year month day. That data seemed all fine. She had me RENAME the folder from Photos to Photos.photoslibrary, whereupon it took on the Photos Library icon which I never recall seeing before, then Command Alt Click the icon to open Photos. It required repair of course and it took a while. It hovered for a long time at 92% but when it got done I could see my photos again. Whew, the idea of starting over and reimporting everything with photos dating back to 2007 was not a pleasant prospect. Hope this is helpful to someone else!!! I try to hold down the CMD+OPT key and it kives me the option to repair but then at about 5% repair its says ” unable to repair permissions for Photo” What do I do?!?!? Please help me! I get to the stage of clicking continue on the photo upgrader, am prompted to Launch Iphoto which I do then get the prompt to have Iphoto repaired and that I need to get the upgrader. I repaired photos as suggested, and it now works. Photos cannot play this video because it cannot find the file. I googled and found many people trying to address this issue (or similar) and most were unhelpful. This fix was the only one that got me anywhere, and it was pretty fast. for me, I fixed this issue by copying Photos Library from pictures folder to documents – it require admin pass. After that a did copy of Photos Library from documents back to Pictures – replace – type admin pass and after opening Photos Library it works for me. I want my MacBookAir to have Repair Library but unable to have Photos pull up and let me click Repair. But I am stuck can’t follow instruction. Library Name and Last Modified show blank. Other hand, should I click other Library or Create New? What is your suggestion on how to fix Photo Library? Thank you so much! I’m not tech savvy and I was afraid I’d have to pay to get my mac fixed, but I followed your steps and it worked! Worked a treat – thank you. This repair worked for me! Thank you! Colleen Kitchen – Thank you, thank you thank you!!! Weeks of dealing with apple, and they had given up and told me my data was ‘corrupt’. Copying the photo’s folder into photos always performed the repair automatically, but with no success. I always ended up missing most of my pictures, and all of the albums etc. I followed your advice. Went into the info section of the photos folder, and it said ‘photos library.photoslibrary’. I changed it to ‘photos.photoslibrary”. I then imported it into photos again, it did the repair (stopped for a while at 92% like yours), and hey presto, I leapt of the sofa! Thank you so much for taking the time to post. I not have all my kids’ pictures back. Thank you so much for taking the time to post. I now have all my kids’ pictures back. I have followed this thread with interest. I too have had a number of major issues with Photos. The weirdest is when I import new photos and it picks up the thumbnail from another unrelated picture in the library. The only way I can get it to correct the thumbnail is to edit the photo. I think the majority of my problems stemmed from the fact that I was trying to keep the original files on a NAS drive and run the Photo App and database from my Macbook. It kept loosing connections and either doing a repair or a check at startup which took hours. I’ve now moved back to keeping the entire library on the macbook and things seem to be more stable. Consolidate: I have recently found that this is a very helpful new feature. If you select a bundle of files and choose Consolidate from the file menu – you can then point it at your external drive location and it will import all the photos it does not have the original file for into your library. It will skip the ones that are already there. It gives you a little progress clock on the menu bar. Some intelligence at last! “The System Photo Library could not be opened.” was the error message I was receiving when I tried to save pics from texts I received. It took two times running it but the CMD+OPT while opening Pictures worked just fine. Problem solved. Thanks! This worked for me but did not solve my problem. I have random errors that show up across my photos when edited. Sometimes its a clip of the edited photo or just a big red/black square that covers a portion of the image. The error will be exported with the photo when I convert it to JPEG and will not go away. HOLD DOWN OPTION KEY WHILE LAUNCHING PHOTOS. Find library location, should be displayed below on the window that opens. I followed that advice, now ALL my photos have disappeared. Years of them. How do I get them back ? I recently had to recover my photos library after a hard drive failure. I’ve started photos using my new hard drive. All the pictures are there if I go to All Photos, and the albums are all good, but if I go to “photos” at the top of the side bar, I get the welcome screen. Behind it are a list of dates (black writing on a white background). So I can’t see the moments, collections, years at all. Any ideas? Is something wrong with my photos library? thanks for the info but it diodn’t work for me, I am seing incomplete sync between Sierra “photos” library and iucloud. All my iPhone pics [iOs10] are in the iCloud “online” photos and are sutomatically synced fully to my ipad but only some come to the mac. I tried the rebulid, also signing out of iclod on the mac and back in. A few more pics appeared after signing back in, but not ALL recent ones. A lot are missing and its been like that a whold day so it’s not updating. Repairing photos didn’t help my problem. I backed up my iPhone 6s Plus to my brand new iMac and wanted to import my photos from phone to photo app on iMac. It stopped mid way saying it quit unexpectedly. So I did some research and repaired my library and tried to import the photos onto my iMac again to fire up some space on my phone and it quit again just like it did the other couple of times before I repaired my library. I RESOLVED THE ISSUE!!! Hurray! Simply hold OPTION (NOT- OPTION and COMMAND) and do so the very moment you try to open PHOTOS, and then use the OPTION, CREATE NEW LIBRARY by creating a New Folder and giving it a name and then hit, GO!! All is well now. Cheers! my photo library does not give the repair option what should I do? Running High Sierra 10.13.3. Photo when in library is OK. When transferred out in to anything it loses the date it was taken. Ran the repair and no improvement. Those arrogant ********* at Apple. Every time they update the OS, I lose big chunks of my photo library AND it screws up the dates. I upgraded to El Capitan and consequently from iPhoto, to Photos. During this process, the thumbnails for all photos were lost. Even though I’ve ran the repair procedure many times, it does not fix the issue. Any suggestions on how to resolve this issue? Follow the above procedure for creating a NEW LIBRARY. Make sure that Photos is pointed to it. Quit Photos. Reboot. HOLD Option+Apple, double-click Photos App. REPAIR the Photos Library. That solved all my confusing double, triple, copies, and repeated NEW photos when plugging in my 10.5” iPad Pro. After waiting a couple hours, and the collection looks complete, I trashed the old library file. Cmd+Option didn’t work for me. No repeit button. Fortunately I had a backup. Anyway, I am absolutely stunt how a library/folder/directory, name it, can dissapear just like that !!! I had more than 50Gb of data there! And it dissapears ?!?! People from Apple, how is that possible ?